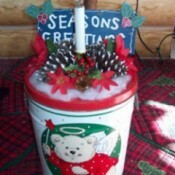 Lighted Welcome TinReuse those Christmas popcorn tins to welcome your holiday guests and place it by an entrance or anywhere to make them feel welcome and add holiday charm to your home. 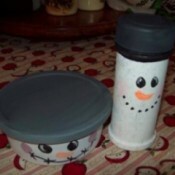 Recycled Snowman Candy ContainersRecycle and reuse those empty plastic spice bottles and deli food containers to create candy holders for your snowman themed Christmas village. Add all sorts of candies to each one for both visual holiday enjoyment and tasteful pleasure. 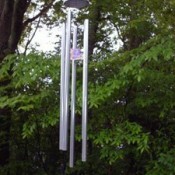 Bucket Wind ChimesMake use of old tin buckets and turn them into wind chimes. When the large chimes I bought broke from the wood ring on top that had rotted from the winter weather, I used my tin buckets as the base and bonger to give them new life and a prettier look. Craft Project: Stenciled BackpacksTurn your otherwise boring solid color backpack into a work of art using stencils to add your own touch and design to it. 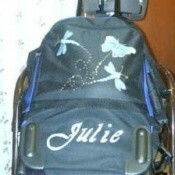 This was my boring rolling back pack that I love to use for traveling but was a darker color of solid blue and not very feminine looking at all. Painted Grill CoverSpice up your plastic grill cover by painting on a summer design. 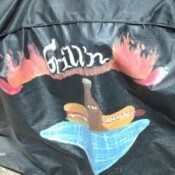 Just by hand painting or even painting your design on with stencils you can give your grill cover a new look for summer. 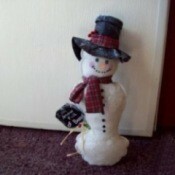 Snow Man Door StopWith just a few scraps of fabric from an old polyester blanket and a few household craft supply items you can create this adorable snowman door stop for your home or as gifts to give for the holidays.